Consumer spending – accounting for about 70% of U.S. economic activity – outpaced income in December, according to the Bureau of Economic Analysis. 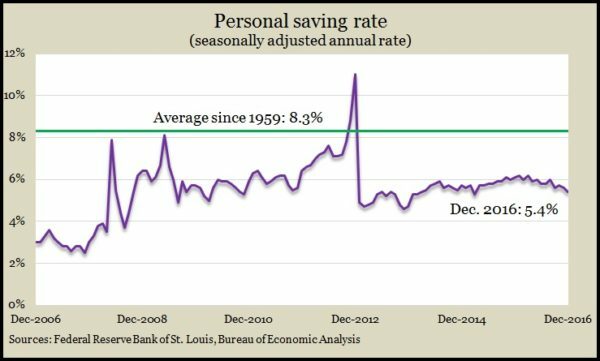 As a result, the personal savings rate fell to 5.4% of disposable income, the lowest rate since March 2015. Also in the report, the Fed’s preferred measure of inflation showed a year-to-year gain of 1.7%, unchanged from November, and still below the central bank’s 2% target. The long U.S. housing recovery appears to be continuing into 2017, based on pending home sales in December. The National Association of Realtors reported a rise in commitments both from November and compared to December 2015. The trade group has forecast a 1.7% increase in existing home sales this year following a decade-high market in 2016. At least in terms of prices, housing has recovered from the recession and financial collapse, according to the S&P CoreLogic/Case-Shiller home price index. The national index reached a new high in November, although the 20-city composite index remains below its 2006 peak. A housing economist for S&P said federal plans for faster economic growth could fuel further price increases, which have been doubling the pace of inflation overall. The Conference Board said consumer confidence declined in January from a 15-year high set in December. The business research group said its monthly index showed a slight setback in expectations but suggests continued economic growth in coming months. The Commerce Department provided more evidence of housing’s revival, although total construction expenditures in December declined slightly from November. Spending on residential building – accounting for 40% of the total – helped expenditures rise 4.2% from December 2015. Full-year 2016 spending was up for the fifth year and finished just off the record set in 2006. Americans bought motor vehicles at an annual pace of 17.6 million in January, the weakest rate since August but still above the 12-month average, according to statistics from the trade group Autodata Corp. Imports continue to have better sales trends than U.S.-made vehicles. Trucks still are doing better than cars. Overall, the data suggest steady consumer spending despite a fall-off from strong auto sales in December. Manufacturing growth rose in January for the fifth month in a row and at the highest level since November 2014, according to the Institute for Supply Management. The trade group’s manufacturing index showed new orders and new export orders rising higher than they have in more than two years. The index exceeded analyst expectations amid concerns for global demand, especially with the strong dollar. The Bureau of Labor Statistics reported continued weakness in worker productivity in the fourth quarter of 2016. Output rose at an annual rate of 2.2% in the last three months of 2016 while hours worked rose 0.9%, resulting in a productivity gain of 1.3%. Productivity has been weak in recent years, rising 0.2% on average in 2016, the slowest pace since 2011. The average productivity growth since World War II is about 2% a year. The moving four-week average for initial unemployment claims rose for the first time in six weeks, just after hitting a 43-year low. Labor Department data show claims continued to remain 31% below long-term levels, suggesting a persistent reluctance among employers to let go of their workers. Employers added more jobs than expected in January and the most since September. The Bureau of Labor Statistics said the unemployment rate rose for the second month in a row to 4.8%, reflecting larger numbers of job seekers entering the market. An alternative measure known as U-6 showed underemployment at 9.4% still as high as it was during the recession. Average hourly wages rose 2.5% from the year before, the slowest pace since August. Non-manufacturing accounts for the majority of the U.S. economy, and although it grew at a slightly slower pace in January, it registered expansion for the 85th consecutive month, according to the ISM Non-Manufacturing Index. Purchase managers surveyed for the index express both optimism and uncertainty for their businesses amid transitions in Washington. The Commerce Department said factory orders rose in December for the fifth time in six months. Excluding the volatile transportation equipment category, orders rose for the sixth month in a row, though they’re still behind year-earlier orders. Plans for non-defense capital goods excluding aircraft, a proxy for business investments, rose for the third month in a row but remained 3% behind December 2015 orders.